This seems like a strange, maybe even oxymoronic topic. Yet because of the simple nature of a rock, you may soon experience the most profound understanding of human rights you have ever had. So bear with me a moment while I set the stage. This special rock is from my flower bed. For me, it represents the extraordinary yet ordinary citizen of the US. 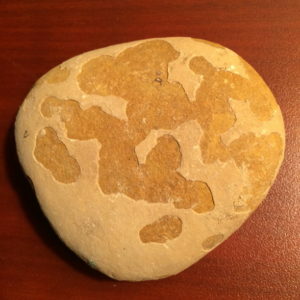 It’s just another rock but there is not another one exactly like it anywhere in the universe. I keep it on my desk while I write about rights. Rocks, or their equivalent, make up most of the mass of the galaxies. Our planet is almost entirely solid, loose, or liquid rock. And the galaxies appear to be the same. Now I say all these rocks have rights, and if they do, it seems like we ought to know what they are. Let me show you. You can remove a rock from its place but you can’t remove its space from the rock. The space a stone occupies belongs to that stone. It owns that space. That space is the property right of that stone and there is not a thing you can do about it. That property right is natural, inalienable and immutable. You bet rocks have rights. Not sure? Then how are you going to keep that stone from taking up its space? Rocks with Rights Is Too Much for You? 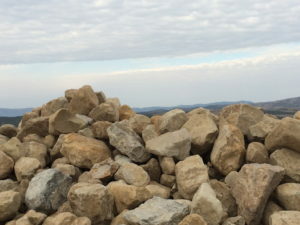 A rock farmer’s harvest near my home. Now some of you will have a hard time with the idea of rocks having rights. I understand that, so let’s forget all about rights for a moment. A right doesn’t really exist in the physical world anyway. The word “right” labels an abstract legal concept we use for convenience while we think about the authority something has over itself. Let’s forget about the abstraction and talk about the physical reality. All the critters and all the plants each do their thing. They grow and some of them move around while others, like the apes, have some real thinking ability. In the solar system the heavenly bodies are under the power of gravity which does its thing. When a human being does something, he can be thought of as having authority over himself to do that thing. We draw out, or abstract that fact so as to focus on it and we give that authority the name of a “right”. 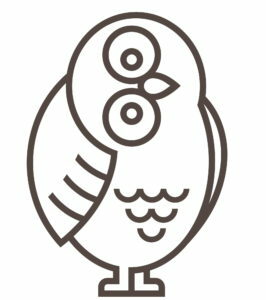 If a bird doesn’t have the authority to build a nest, how can it possibly do that? Authority doesn’t have to be granted by someone in order to exist. 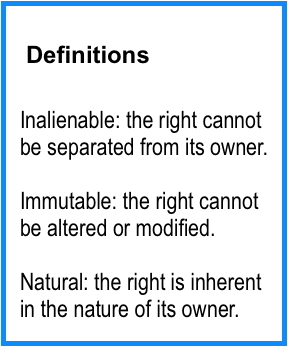 In fact, that is the essence of a natural right. It is just naturally there, it’s inherent. If that makes sense, why can’t we also talk about the apes having rights, and if apes then robins, and then worms, and then the planets themselves. If some “thing” can do something, then it must have authority to do it. Ascribing that authority is just another abstraction that lets us see things in a new light. We can learn a lot from this. Stay with me and see if you don’t get some insights about your rights. You have property rights just like the rock. That’s the first lesson you can learn about rights. And here is the next lesson. You can try to violate the property rights of a rock but there is only one way you can do it: crush it into gravel or grind it to powder. But now you don’t have a rock anymore, you have gravel or dirt. That proves that the property rights of rocks are inalienable. You cannot alienate the right from the rock. Period. You either have a rock with rights or you have neither. That is the most important lesson you can ever learn about human rights. A “right” is just a word for the legal authority you have over yourself. Now, to get full value from the time you are spending reading this, go back three paragraphs and ponder their meaning in terms of your own rights to life and the things you are capable of doing. If that is not profound, read it over until it is. I guarantee it. So let’s see. Rocks have a right to their space, their home if you will. What other rights can we find for a rock? I guess they have a right to be heavy, don’t they? What if I decide I don’t like my rocks being heavy? Same problem. I can’t violate that right without violating the rock. That’s what inalienable means. That is the most important lesson you can ever learn about human rights. Well, at least about natural human rights. Yes, I said it again. I want that to sink deep into your heart and soul because the very essence of your life is your authority over it. Hang on, we’re just getting started here. We’ve been talking about natural rights, the stuff that Jefferson and his brethren used as the foundation of the freedom in which this nation became, and still remains today, the most sought out place in the world to acquire property rights. I don’t mean just real estate, I mean a place where a person can use his rights to choose a place to be, to live, and to move and do according to his own will. Now some of my readers will complain that attributing rights and authority to inanimate objects is just strange. That’s OK, there’s enough space between words and their meanings for all of us. But think about this: when you jump off my roof that big rock we call earth takes over and exerts its power over you. Can you do anything about that? Power, authority, rights – all the same thing. Let’s call a spade a spade and see what we can learn from that. 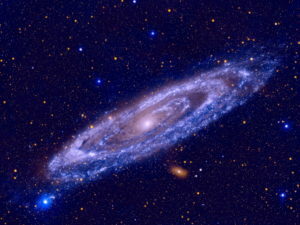 Andromeda, our nearest spiral galaxy. Turns out that big rocks not only have their own natural rights, they have rights that supersede other rights. I’m talking about astronomy now. If you jump off my roof, you’ll be sorry. It’s too high and when you put yourself wholly under the authority of gravity you will lose some of your rights, at least for a moment. Of course, that’s nothing compared to the authority gravity has throughout our universe. It has the authority and it does its job. We had to work hard to put a man on the moon. So we exercised our rights and overcame those astronomical rights. But we can never destroy them. And that’s the point. What we can see here is that the physical universe has order, and that order is maintained by various authorities vested in its various parts. If that is true, then the authority of a human being, his rights to be and to do, is just as real, and just as compelling as any other object in the universe. This is not rocket science, just simple fact. Here’s another insight about legitimate authority: A contract is a way of creating and assuring order. In a contract we use our freedom (rights) to restrict that freedom in certain ways. By that restriction we establish an area of freedom, focus capabilities and control the future. Marriage is one of the most powerful and enabling contracts we can enter into. It is an opportunity to create something that is greater than the sum of its parts. It’s one of life’s dilemmas that we can create freedom (which is composed of rights) by voluntarily restricting our freedom (the exercising of other rights). Grass makes a contract with the soil: to hold it in place in exchange for water and nutrients. Another example: if you want to go to the moon, you make a contract under which you will be completely confined in your seat and put yourself totally at the mercy of the rocket system. It’s a trade off of rights for rights. The rights of rocks are real, natural, inalienable, and immutable. There really is no way to avoid this conclusion. At least, not without throwing this discussion into a semantic tizzy. Now, about those “unnatural” rights. If we turn this whole thing over and look at the back side — maybe when we talk about rights granted by legislation we should call them “unnatural rights” so we don’t forget where real rights come from. Maybe when we pursue goals like “social justice” we should think carefully about what effect those legislatively granted, unnatural rights or authority will have upon the inalienable, immutable, natural rights of citizens. It means that natural rights are hardly something we can debate. Discuss, of course, but like gravity, they are just there. Since natural rights are untouchable, we may wonder, and rightly so, whether there are any other “real” rights. We sometimes think about rights that can be traced to legislation. But are those real rights or are they manufactured rights? What would happen if the rights, authorities, and powers (whatever you want to call them) of the heavenly bodies were terminated? Horrific to say the least. And then what happens when human rights are wholly violated? Same. Furthermore, what would happen if a star the size of our sun should join our solar system? Chaos. Then what happens when a legislature grants rights to one class of citizens and excludes the rest of the people? Surely there is something we can learn here. 1 Benner, Dave. “Today in History: John Locke Was Born.” Tenth Amendment Center, 29 Aug. 2018. 2 There is a powerful, confirming parallel here. Under the confederacy there was considerable chaos in and among the colonies. The transformation under the new constitution was remarkable in both time and space. It took only a few years for confidence to reign. A dramatic prosperity broke out across the entire new nation.